Interested in purchasing a tier 4 engine? The latest round of Environmental Protection Agency (EPA) regulations on diesel engine emissions are meant to cut down on pollutants that are harmful to the environment and human health. They target specific byproducts which have shown to create smog and contribute to the buildup of small particles in the respiratory systems of the humans who inhale them. But the new, final Tier 4 regulations, which went into effect at the end of the 2015 calendar year, have been causing problems for some diesel engine users. Not the least of these Tier 4 problems is simply this: customers are not sure whether or not these standards apply to their specific diesel engine application. 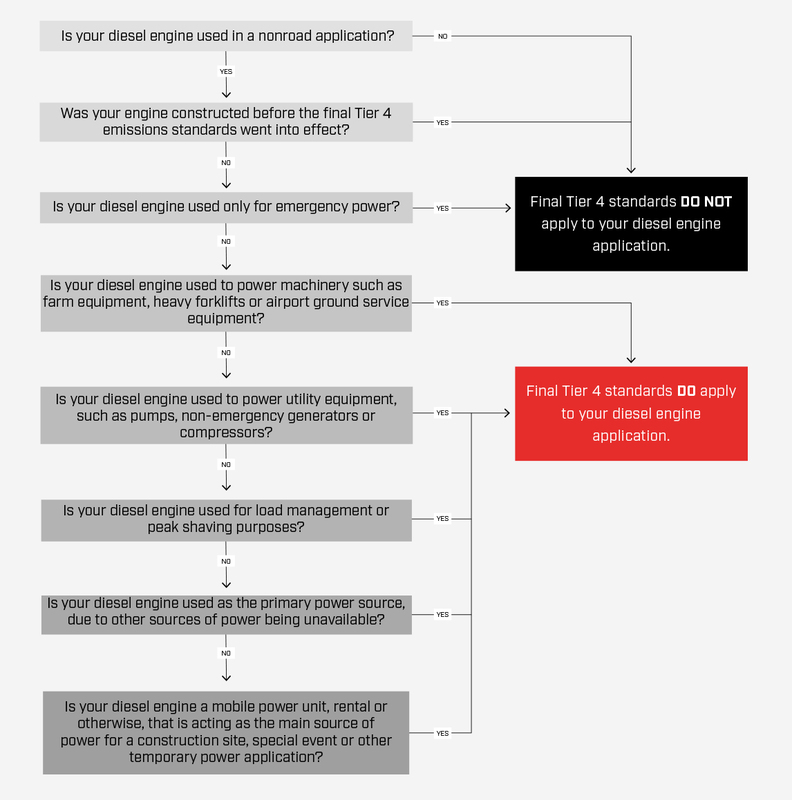 We’ve created a flowchart below to help diesel engine users determine whether or not their particular application is affected. Start from the top and work your way down. Do Final Tier 4 standards apply to your diesel engine application? Still unsure and have more questions? We offer Tier 4 consultations to help find solutions for your applications. Need your tier 4 questions answered? 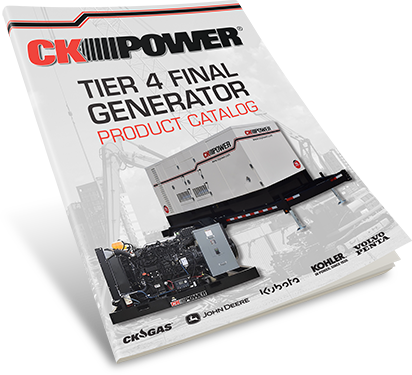 Request a Tier 4 consultation and someone from CK Power will be in touch shortly to begin finding solutions to your Tier 4 problems. 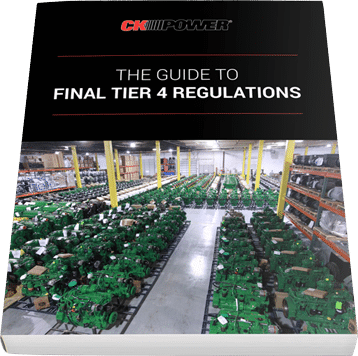 Looking beyond the basics of which applications do tier 4 regulations apply to, we’ve put together the following explanation of the most common problems and how they can be addressed, relieving headaches for those looking to satisfy the new EPA regulations. How will final Tier 4 solutions fit into my current manufacturing operations? 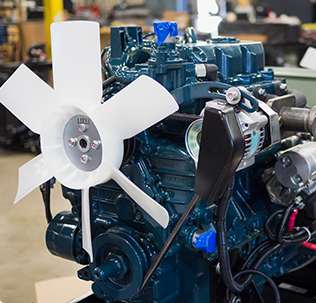 The most common issue we confront with original equipment manufacturers is how to go about merging existing specs and processes with entirely new engine equipment. It’s an entirely understandable dilemma. Manufacturers typically aim for the lowest possible throughput time by increasing the efficiency of their process wherever possible. Introducing a new cog wheel into such a finely calibrated system has the potential to jam up the whole operation. Manufacturers could be forgiven for believing they’ll need to start from square one. Many of the same customers have often been ordering engine equipment from us for years. And it was easy. The manufacturer would convey to us horsepower requirements and we would provide a menu of options, all of which would be suited to the customer’s application. A choice would be made and that was that. Now, the buying process has changed. Besides not having the same menu of options available, manufacturers are also receiving complicated estimates from some dealers. An engine manufacturer may quote one price, without mentioning that components crucial to meeting the final Tier 4 emission standards are not included in that price, or at least not assembled already. Ordering based on horsepower requirements alone has gotten more difficult and placing orders based on low bid alone can have repercussions. Sound familiar? It’s something we’re hearing more and more often from manufacturers who buy directly from an engine manufacturer. For many of those companies, the relationship might end with the sale. But with the deadline for the implementation of final Tier 4 emission standards knocking on the door, we’re seeing that it’s about more than simply having the right piece of equipment on hand. Expert service is paramount. Regeneration equals downtime for our customers. And, as such, it needs to be controlled for wherever possible. To burn off excess particulate matter in order to meet the new emission standards, the diesel particulate filters on some final Tier engines will periodically need to function above normal operating temperatures for a time. Since they cannot be used while performing this function, it’s important for customers to know which products require regeneration time and how to work around it. Each of the manufacturers of the various engine lines we carry has been forced to adapt to the new Tier 4 regulations in their own way. It’s led to some surprising and innovative new technologies to be adopted in the various diesel engines. Always a leader in the field, John Deere has come up with some imaginative fixes for cutting emissions. One strategy is known as selective catalytic reduction (SCR) and diesel oxidation catalyst (DOC). This strategy works by raising the combustion temperatures at which the engine operates, which leads to a more thorough burn off of particulate matter. Further reduction of particulate matter occurs in the DOC as the result of the oxidation that takes place there, turning the remaining particulate matter into less harmful byproducts. This accomplishes half of the target of the standards, but has the unfortunate effect of creating more NOx due to the higher operating temperatures. To lower the amount of NOx emitted, a diesel exhaust fluid (DEF) is introduced into the exhaust stream. When the exhaust is combined with this exhaust fluid, it is broken down into nitrogen gas and water vapor. The second strategy is known as cooled exhaust gas recirculation. It works by mixing measured amounts outside air to reduce the amount of particulate matter in the system. The remaining particulate matter is then passed through a diesel particulate filter, which traps the remaining particulates. Next, using heat from the engine itself, the particulate matter is oxidized to create nitrogen gas and carbon dioxide. These byproducts are then released as exhaust. The John Deere Integrated Emissions Control (IEC) system, as this twofold strategy is known, works to address the Tier 4 engine problems introduced by the new emission standards. Volvo Penta engines will also make use of selective catalytic reduction to meet emission standards. In addition, an Exhaust Gas Recirculation (EGR) air throttle system will help to reduce the amount of NOx emitted by the engine as a result of SCR. The air throttle controls the amount of air entering the engine, which in turn affects the exhaust temperature that determines how much particulate matter is burnt off during SCR. The throttle closes partially during light loading to maintain the necessary engine temperature for meeting those requirements. These combined strategies help both to reduce wear in the engine over time, and to prevent the need for downtime for regeneration that is a part of some other manufacturers’ approaches to solving Tier 4 problems. Kubota also uses cooled EGR air management technology to reduce NOx emissions at a lower combustion temperature for more efficient combustion and better performance. The engines also utilize a wall flow filtration system to trap excess PM plus DPF after-filtration for cleaner exhaust. Check out the video below for an animated representation of these technologies. We certainly hope we’ve addressed some of the issues you may have encountered in satisfying the EPA’s new final Tier 4 engine problems. But if we haven’t, we’d love to talk. You can always contact us to discuss the new standards, or download our comprehensive guide to the Tier regulations through the form below.